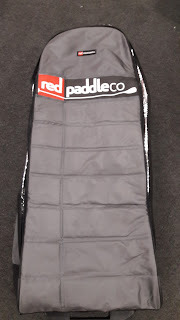 Red Paddle Co's new size in the Sport range. The 11'3" fills the gap between the lively 11' and the more touring orientated 12'6"
This is such a useful size board. 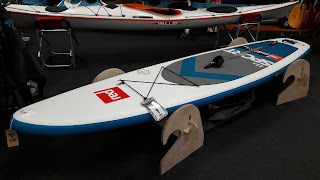 It offers that bit more for the exploring paddler than the all-round Ride series. It has the forward speed of most other 12'6"'s but without loosing stability. It has a nice balance with the wide point being right by the handle, just where your feet should be. The tracking is great, the large 9" FCS2 SUP Touring fin really holds the line but you only have to step back a touch to free up the nose and get the board turning quickly. When you do shift your weight back it stays stable due to the wider tail. Its more stable on the back end than the Ride series, and that is down to that wide tail and large fin. Overall a quick, stable and responsive board. 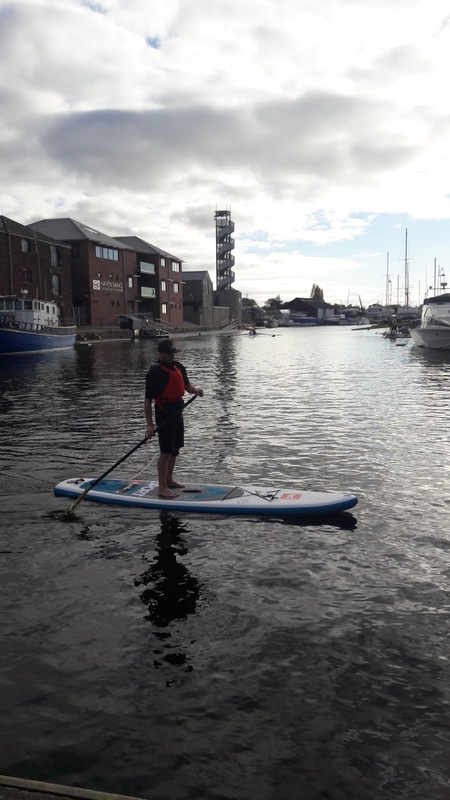 Good glide for ease of paddling on longer journeys but not so big its not fun to paddle. The pulled in nose keeps the waterline and helps with the glide of the board. Even at 11'3" it doesn't look big. The wide tail really helps with the stability for stepback turns. Updates to the coiled leash are good. 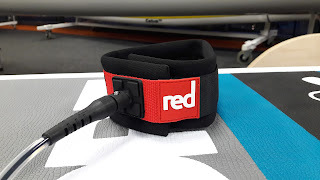 Better neoprene padding on the cuff and loosing the adjustable webbing bit was a good move. RSS Battens down the rail help with the stiffness. A lighter bag helps with transporting it. 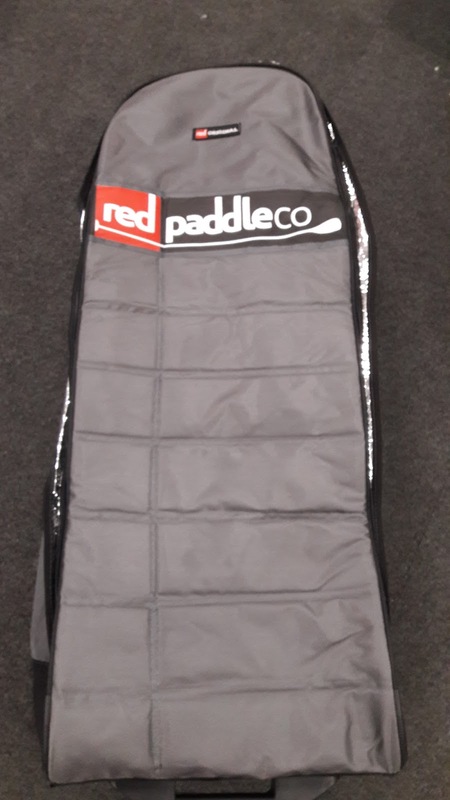 A nice big pocket inside for your fin and elastics to keep your paddle in place. Very little flex in the board due to the RSS battens. Demo board available now. Call 01392 219600 to arrange a free demo. Dagger Nomad 2016 review, the "Newmad"
A.S Ambassador Gary Peverill was one of the first folks to pick up the new Dagger Nomad from the shop. He's been away in the French Alps and beyond with the boat this summer, coaching and paddling for pleasure. Check out his thoughts below. Size large available for demo now. Call the shop on 01392 219600 to book a go in the latest version of the world famous creek boat. For years now I have been paddling a Nomad 8.5, which I loved but always found it a bit small and quite unstable. I always hoped Dagger would add an extra size up, and now they have! 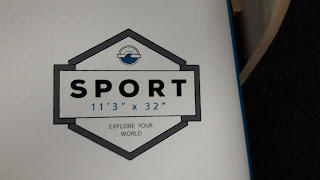 The 2016 Nomad has 3 different sizes of boat and the large one is bigger than the old 8.5. So I ordered a new red one in large and haven’t been disappointed. 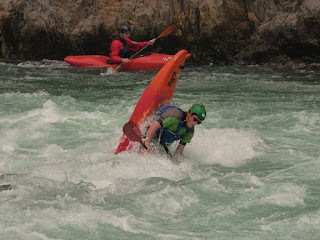 A few weeks later I spent 10 days in the French Alps kayaking, which gave me a great opportunity to test it out. 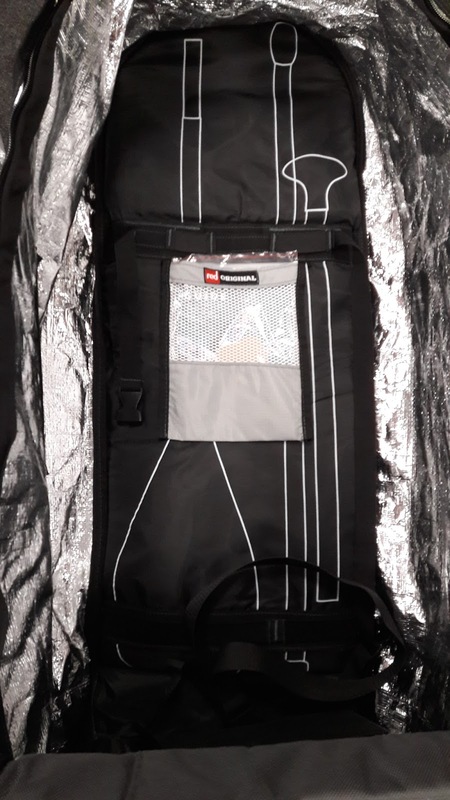 The Nomad is big, it holds all the kit you want such as: splits, 1st aid kit, repair kit, rescue kit, phone, wallet and keys, lunch, drink, throw bag and the kitchen sink. I got 2 big airbags to keep the kit as close to me as possible in the boat and for any rescues on the boat. 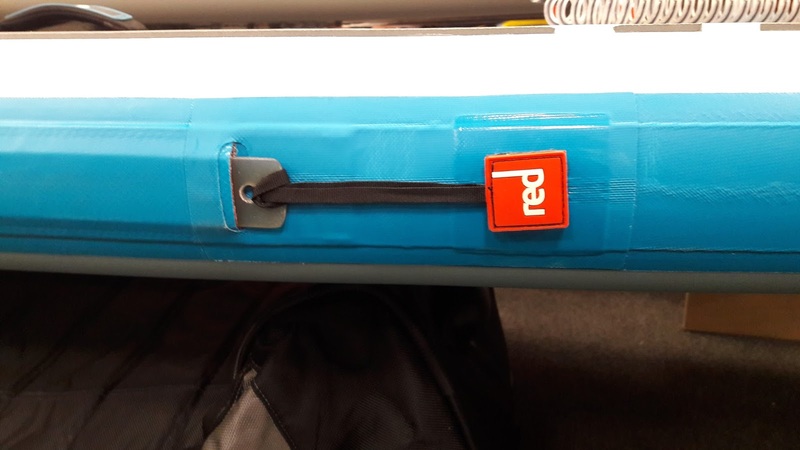 I moved the seat forward as much as possible, this kept the boat slightly bow heavy to engage the edge more and loosen the stern and allowed my hands to paddle at the lower/narrower part of the boat. The seat has an extra insert which lift your body up for better reach over the boat and make you feel less low in the boat, I am not very long in the body and being 5’9 and 16 stone I found big boats an issue for reach etc, but the nomad felt good. The fitting out foam for the foot rest, seat, hip pads ect was very secure and very comfortable and never gave me dead legs which is a first. The boat has loads of rocker which meant it didn’t get caught out in holes or pushed around by random flows, it also made it very manoeuvrable yet didn’t hinder its forward tracking or speed. The hull is slightly flatter with edges, this helps for stability and carving turns. However it still boofs and flairs and lands well after drops. 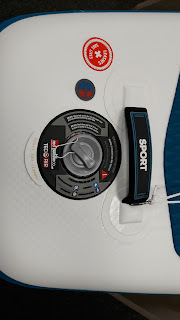 The boat surfs quite well, easy to carve and hold position as well as flat spins and control in holes and stoppers. 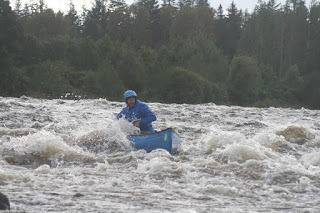 General river paddling has been made easier which gave me more confidence, but still being able to change direction when needed and set a new course. 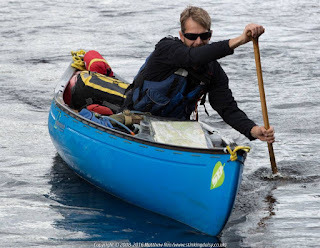 My overall impression of the boat is excellent, from paddling and playing to comfort and confidence, this boat has it all and I would highly recommend it. Now the Nomad comes in Small, medium and large sizes, it’s worth taking a demo out as the sizes overlap the old 8.0 and 8.5. The new design has improved an already great boat. Don't catch Pokemon, catch waves. Catch them all! Safe, solid and great for carry gear. Gary's perfect coaching platform. Big Nomad, Big volume, Big fun. Fully functioning Contour Ergo outfitting with lots of in cockpit adjustment for tweaking on the fly. The Nomad is still very agile. I have used Werner paddles for over 10 years now and they have never let me down. 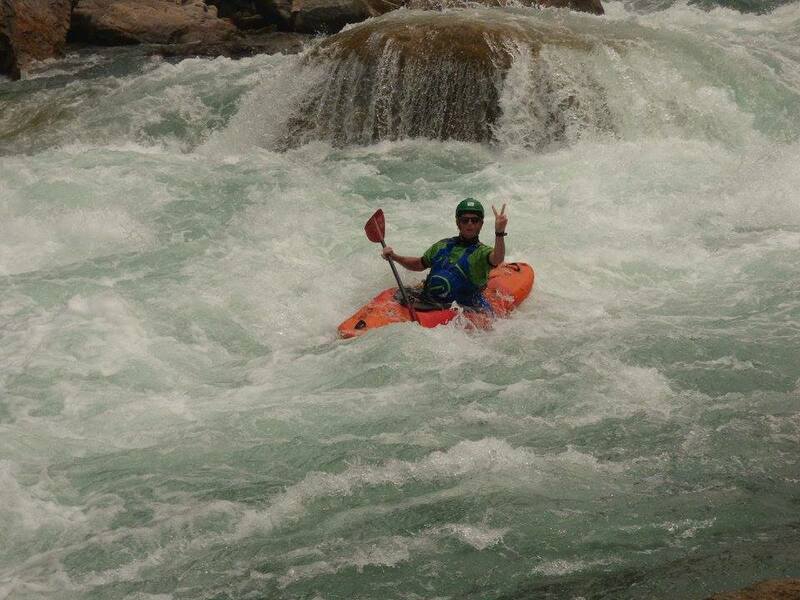 My Favourite canoe paddle is the Nantahala, I use it for white water and open water canoe paddling. It is really light but incredibly strong, I have bashed off many rocks and pushed myself along punting off the river bed with no problems at all. 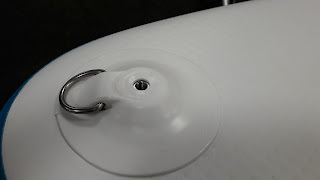 The white blade is easy to see if you drop it in the water, as well as giving signals from a long way away. The blade is symmetrical so it pulls and cuts though the water really easy with no change in direction. The glass shaft is very strong; I use my gunwale to guide the paddle and to pry off, the paddle handles this with no problem. The shaft is slightly oval so it makes it easier to get a good grip when transferring the power. The shape of the blade gives instant power but with a slight flex in the shaft it’s very controllable with no flutter. I use the Nantahala for white water and open water, I find touring with it no problem due to the lightness of the paddle, and it’s also really useful if it is bit windy just to get that extra power. The T grip gives control and comfort; I glue and rivet mine into place once I have set it to the right size. 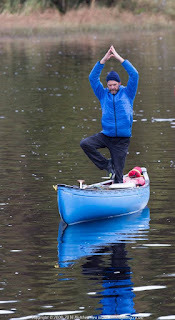 There are many different guides to sizing your paddle, but I think it is a lot to the type of paddling you do and your body size, I like a shorter paddle length which allows me to recover it quickly, but I gain power though my body and tactical paddling, if you go for a longer paddle then you gain on leverage but movement is a bit slower to recover. I am quite a stocky paddler, my height is 175cm tall and my paddle is 143cm long which is about 7cm below my chin, I generally paddle with short stokes and keep my hand about 4cm above the gunwale as a norm. The best thing to do is try different shaft lengths and see what suits, before you cut your paddle! 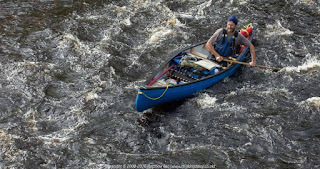 My best stroke for the Werner is Forwards power with a Stern Pry to get maximum power and control which in turn gets the canoe moving and gives you steerage. 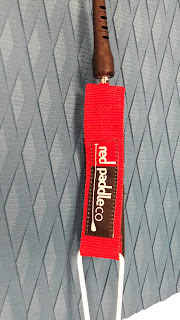 This is a paddle which I would highly recommend and will last a lifetime. 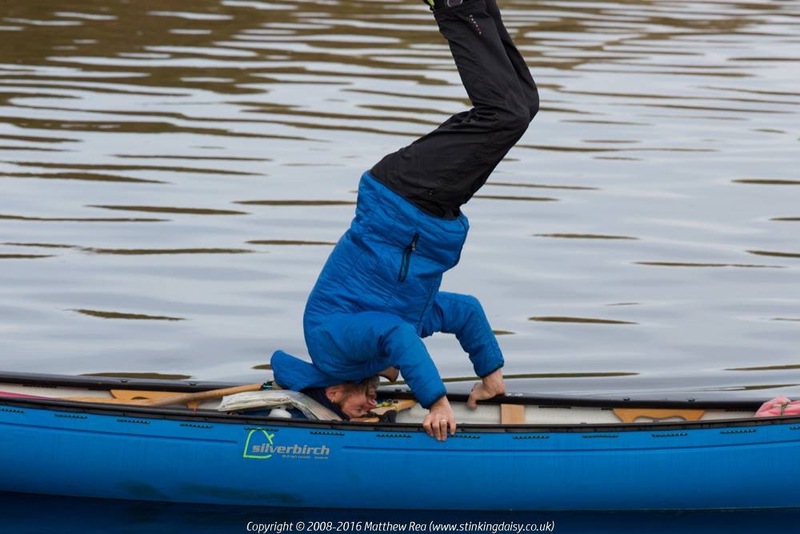 Silverbirch Canoes are the new kids on the Canoe block. Despite being new to canoes the team behind the brand are far from new in manufacturing paddlesports products. They also produce the fastest growing Sit on Top brand in the uk and have a long history of boat design including high performance surf craft and using top end high performance materials. The Covert 9.3 is the first OC1 from Silverbirch and has come at a time when the much loved Dagger Ocoee is rarer than hens teeth. (no new production, just well loved 2nd, 3rd, 4th hand ones). The Esquif L'Edge is probably the most similar thing to the Covert. Ever seen one? So if it's OC1 fun you want for white water river running and playing the Covert is the stuff of dreams. UK designed and made this boat could not have come any sooner. Staffer and open boat expert (complete with beard ) Jim took the AS Watersports demo Covert out for a spin on the famous "Loop" section of the River Dart. This run is full of fun, wave trains and holes. The perfect testing ground for a nimble white water boat. Setting up for the first surf of the day. Silverbirch covert 9’3” first thoughts. From the outside the Covert looks like a no nonsense river running OC1, with plenty of volume, good outfitting, knuckle friendly tumblehome and bags of style. Having jumped in the impression continues. The saddle and thigh braces are comfortable and well shaped, while the Yakima footrests offer a solid but adjustable contact point for your feet, which help to maintain a good connection with the boat. Foam lined sidewalls in the cockpit area help to reduce the volume of water the boat can take on while paddling. The covert comes complete with a full foam saddle, Yakimas footrests, Ankle pads and big internal foam sidewalls. The Ash gunwales are also fitted as standard as is the rope for lashing in the airbags. On the water the Covert is stable and confidence inspiring. 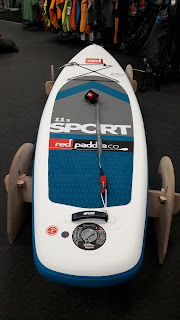 My OC1 skills have become very rusty, not having paddled anything like this in over 3 years, yet as soon as I got on the water the Covert just felt natural and easy. 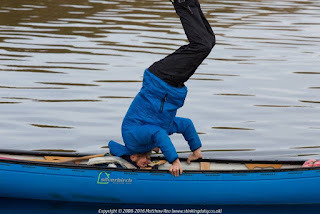 The secondary stability was very impressive and helped to bolster my confidence. 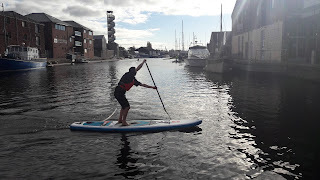 Breaking in and breaking out felt smooth and predictable, even leaning downstream on crossdeck strokes felt easy as the secondary stability allowed me to keep the boat edged well, meaning I could concentrate on my line and strokes and not worry about my balance. Looking well balanced, high and dry. The flared sides and high bow kept the boat very dry while running rapids. Even crashing through the waves and holes on Lovers leap and Triple drop on the Dart Loop the Covert took on very little water. 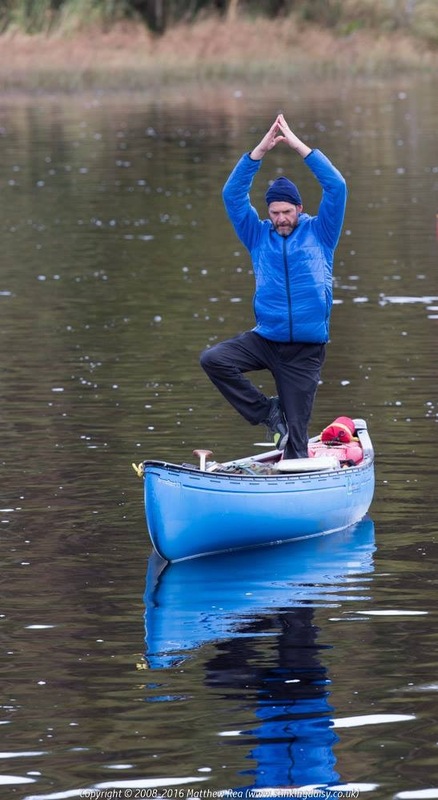 Less water in the canoe means it's easier to control when you need that extra control. 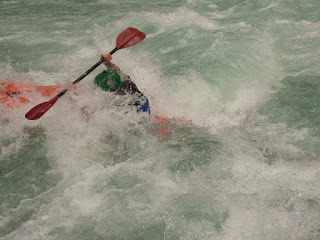 Having a swamped boat in the middle of a bigger rapid with more rocks and holes to dodge is never a fun or rewarding experience! Crossdeck strokes are easy to reach. 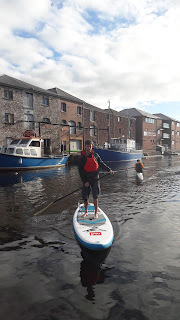 One run of the Dart Loop successfully under my belt and with minimal out of boat experiences along the way the Covert has inspired me to brush up my OC1 skills. I will definitely be out in it again as soon as possible! Jim and the cheeky boys, Max and Dave about to hit the river for a Sunday shred.